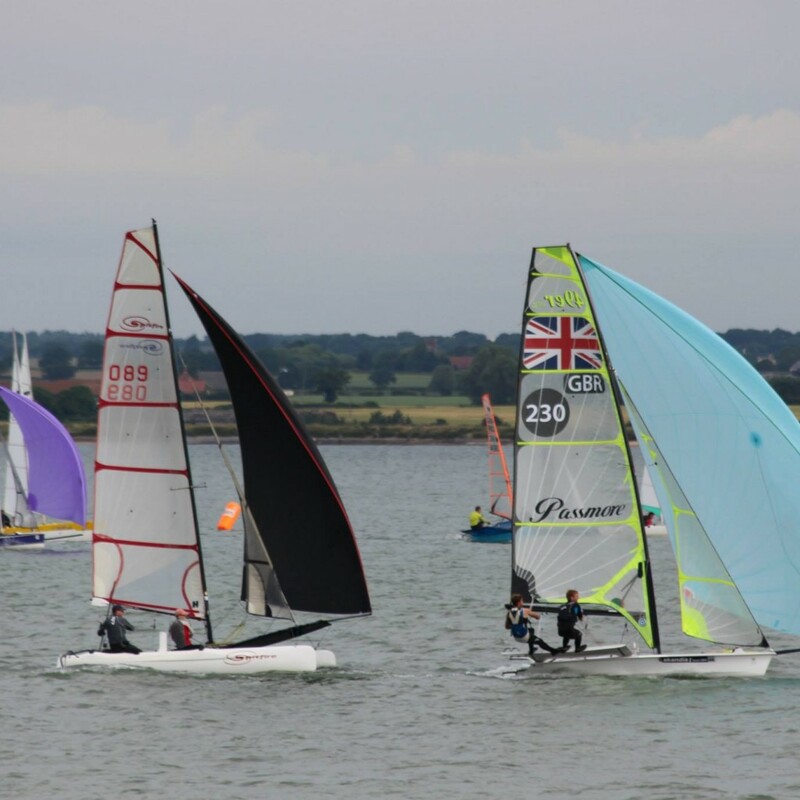 A healthy turnout of Spitfires this weekend at Marconi Sailing Club added to the overall ambience and competitiveness of the East Coast Piers catamaran long distance race weekend, and showed once again that the Spitfire Class is one of the most vibrant on the cat scene. 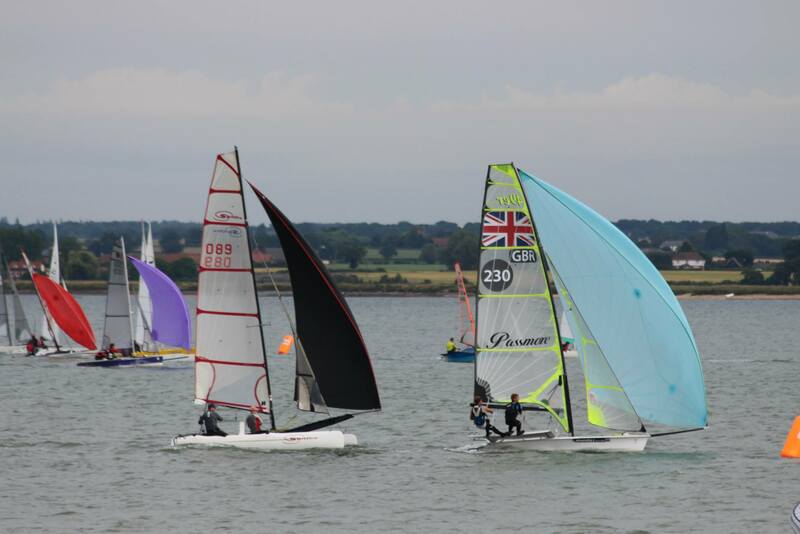 Six Spitfire teams collected in glorious conditions on Saturday for the short racing, with another two joining on Sunday, in an event that attracted 75 boats overall (inc. 10 monohulls participating in their own race). The makeup of the Spitfire fleet proved the versatility of the boat, containing; 2 parent/child, 3 all UKCRA youth teams, and 3 all adult combinations, with sailor ages ranging from 12 through to our more senior sailors.Credit goes to Nia Crockford who, having been through the youth squad, extended her considerable experience and skills to two local junior crew over the weekend, both of whom are now keen to proceed into the youth system. 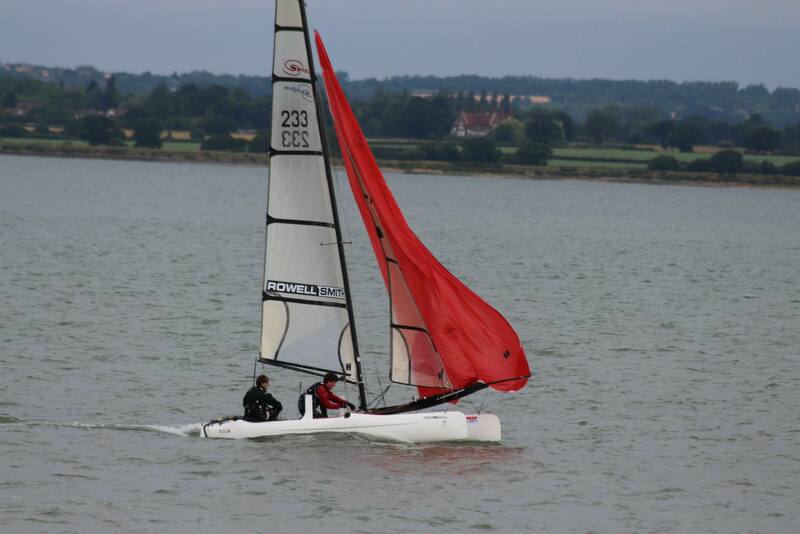 Saturday racing consisted of two shorter course races in the Blackwater estuary in light but steady breeze and, of course, the fearsome local currents on a falling tide. 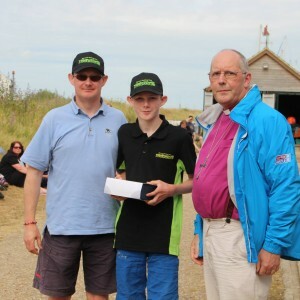 In the first race, Olly Harris and son Ben (Weston SC) showed the rest of the fleet the way, eventually crossing the line with the big boats and winning overall on adjusted time. The rest of the Spitfires followed led by local pairing of Jenny and David Ball (Marconi SC). The two youth selected EuroSAF teams (Bridle/King and Butters/James) then paired off for training, while the remaining 4 Spitfires competed in the 2nd race with Olly and Ben once more leading the Spitfires over the line in 9th, achieving 4th place overall in the Saturday racing, a fantastic achievement for our Class committee member and son duo. A long hot summer evening BBQ and band prevailed, ably assisted with sponsored beer provided by Southwold brewery (proceeds going to Essex Air Ambulance), to help celebrate event organiser Andrew Dowley and wife Michaela’s 30th birthdays. A fantastic evening was had by all… and a few bleary eyes the next day. Sunday dawned with almost perfect conditions. 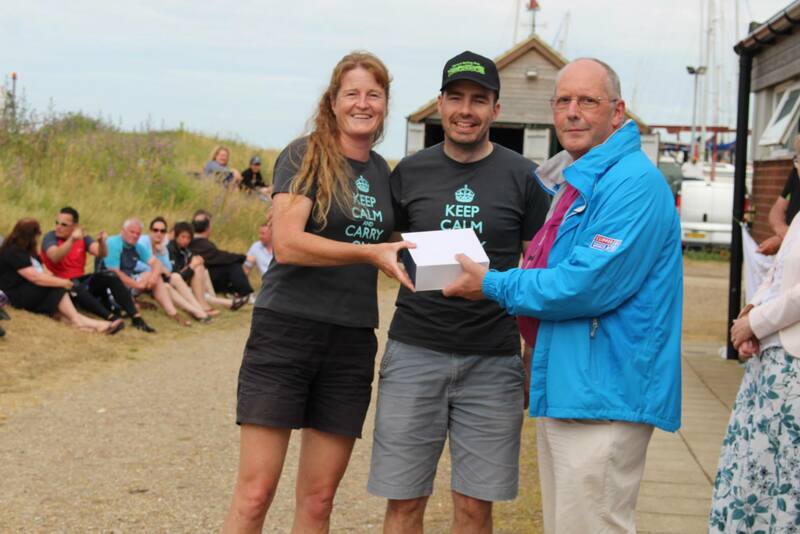 A stronger than expected westerly breeze and two races for competitors to choose from; the East Coast Piers Race (this year shortened to 34m due to offshore Wind Farm engineering works past Clacton) and the shorter 24m Colne Point Race – the latter being stipulated for the youth crews. Three Spitfires chose the ECP race (Ball/Ball, Rowell/Smith & Cleaver/Cleaver in their Spitfire S), the remaining 5 in the Colne Point Race. The ECP race got under way with a clean start at 9:45. Sam Rowell and Dan Smith were 3rd off the line leaving a lot of the faster boats behind. The teams competing in the longer distance East Coast Piers race had a perfect run down to the turning point of Clacton Pier. Sam & Dan were the 5th boat to pass through the Bradwell gate and 8th to pass through Clacton. Most teams spent almost an hour with spinakers up surfing the waves on one tack without having to gybe. As always the once returning back upwind more effort was needed with both helm and crew at the back of the boat on a return reach. 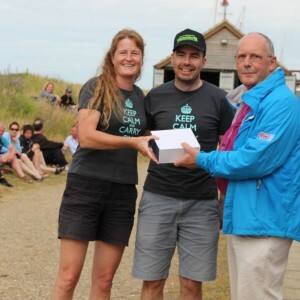 A strong tide returning into the river after Bradwell power station meant that the locals could take advantage and Jenny and David Ball took 10th place overall after managing to creep past Sam and Dan, beating them by just over a minute at the finish line. Sam Rowell and Dan Smith came 12th and Michael and Alex Cleaver came 25th. The Colne Point race followed at 10:00, with Nia and Jack Collis deciding to join us on water at the 1 min gun, the race got away cleanly with Spinnakers hoisted and everyone choosing a committee boat start, except Bridle/King at the pin end. This proved to be a decisive choice as they reached almost to Bradwell without gybing, narrowly missing Radio Caroline mid-river, and with a healthy lead which was all but lost following ‘course confusion’ at Bradwell point from which the 3 Spitfires of King/Bridle, Harris/Harris and Butters/James emerged vying for the lead of the CP cat race. 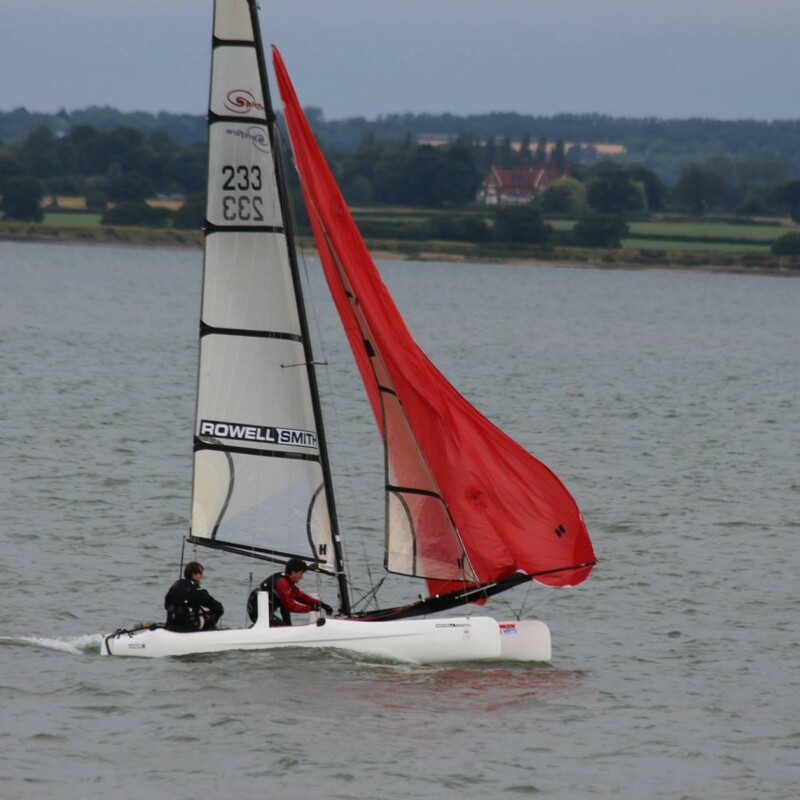 This continued around the top mark, back across the bay and into the Blackwater estuary where they were caught by the foiling Vampire of Will Sunnucks competing in the ECP race. Not to be outdone and now in a lighter breeze and fighting a fierce tide, our brave Spitfire sailors showed the foiler their heels and kicked on, leaving the Vamp in their wake. Butters (along with the rest of the fleet) chose left along the deeper southern shore, Harris and Bridle chose right chancing their luck across the sand bars of the north shore. Local knowledge paid off with Bridle/King crossing the line c.30secs ahead of Olly and Ben Harris, with Butter/James (Parkstone SC) some way behind, the tide having put paid to their challenge. The remaining boats all finished in respectable times and places and it was great to see the young and the old swapping places on the water and experiences off. 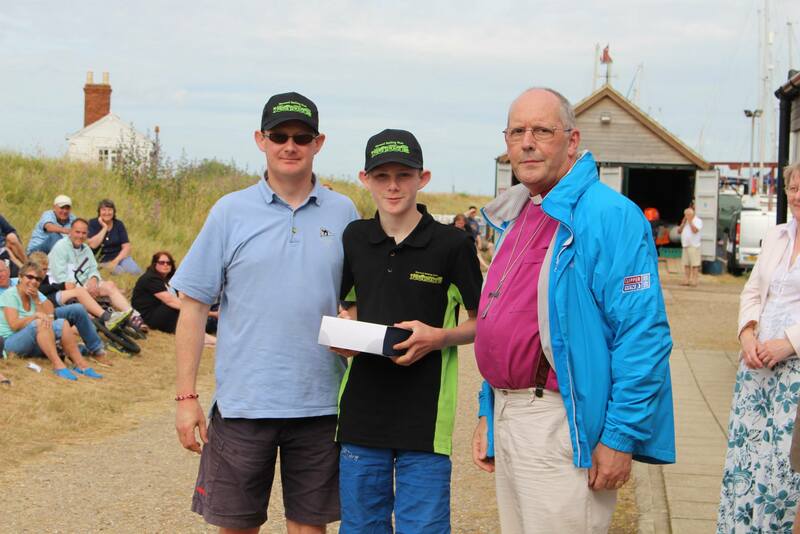 Well done to Eddie Bridle and James King (Brightlingsea SC) on winning the Colne Point Race outright and to Olly and Ben Harris for coming second overall. Also to all our sailors for turning out for such a successful weekend, which was testament to the superb planning and execution by a club that not only knows how to hold a race weekend and throw a party but, with monies raised going to local charities, also ensures the profile of catamaran racing is raised across the East Coast communities as a whole.